The Temple Railroad and Heritage Museum will host author Dr. J. Parker Lamb for a book signing event at the museum Saturday, August 11th, from 2:00PM to 4:00PM. 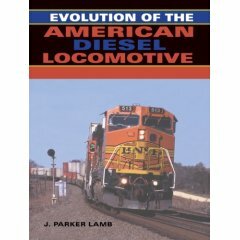 Dr. Lamb will be signing his latest book, Evolution of the American Diesel Locomotive (Railroads Past and Present). The museum is also hosting a “luncheon with the author” from 12:00 noon. Reservations are required and are $10.00 per person. Call 254-773-4759 to make your luncheon reservations. CentraMod will be open from 1:00PM to 4:00PM in conjunction with this luncheon and book signing event. J. PARKER LAMB, Ph.D., P.E., is Professor Emeritus at The University of Texas at Austin’s Mechanical Engineering Department. He has served on the College of Engineering faculty since 1963 in many different capacities. He has been photographing trains since the fall of 1949. His life and career have taken him throughout the Deep South and on to Ohio, Illinois, North Carolina, and finally Texas. Read Classic Trains Magazine’s bio on J. Parker Lamb. You can see some of J. Parker Lamb’s photography in the Winter 2000 issue of Classic Trains magazine.